Celebrate all of the happenings of summer camp with us...and ICE CREAM! This is a free event! Reconnect with camp friends and faculty at our High School Retreat! Register Online or download a registration form! Please R.S.V.P. for food preparation purposes. Are you one of those that know just a little bit about a lot of stuff? Grab some friends and put that knowledge to the test! Teams of up to 10 people, bring snacks for your team and we will provide coffee and pop. And don't forget to wear your ugly Christmas sweater! There will be a prize for the ugliest Christmas sweater! Bring your children, grandchildren, nieces and nephews and come make some Christmas memories! The MCC Cookie Bake is a great place to bake those special treats for friends and family and not have to clean the mess! Tickets may also be purchased by contacting the camp office. $12 for 2 1/2 dozen cookies. Often we find ourselves feeling trapped by routine, or busyness, or the mundane. We strive for control, until without warning, things are a mess. How do we get to this point, and even more importantly, how do we get out of it? Friday and Saturday: $55 if registered by September 24th; $65 if registered after Sept. 24th. A day designed just for you. Come join the fun and fellowship with new and long time friends. Games, singing, and a program are packed into just this one day. A morning snack and lunch are also provided. Junior faculty are a very important part of camp. If you have ever wanted to serve in this role or have been asked by a dean to serve, this is a mandatory training day for you. You will learn what it takes to be the best junior faculty you can be. If you are interested in being junior faculty, please contact the camp so we can find a placement for you. Attendance in this training alone does not guarantee you a placement. If you cannot be in attendance on this day, we ask that you lift up your camp to our heavenly Father from wherever you are. This is a very important event in starting out the 2018 summer season and we appreciate your partnership in this ministry. A day designed just for you. Come join the fun and fellowship with new and long time friends. 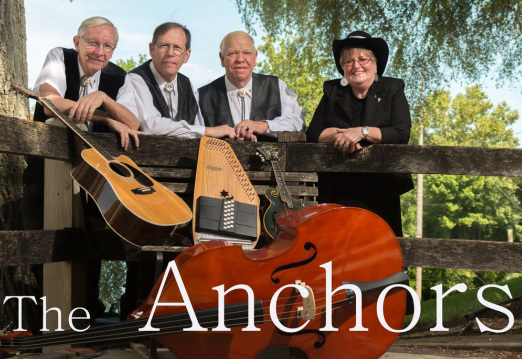 Featuring: The Anchors Band. They are starting our 9th year of performing together..."keeping old-time gospel music alive”. A morning snack and lunch are also provided. The LAUNCH is a free event for all ages! Whether you have been to Michiana Christian Camp 100 times or this is your first time, this event is designed for you! Tours, games, inflatables, food, friends, a photo booth, all to celebrate the upcoming summer. Bring a friend and come play the day away! Work Day is being moved to April 21st beginning at 9am due to the threat of inclement weather. Please pass the word along and come out on April 21st to help get the camp open for the season! Can't wait to see you all there!! Are you looking for an opportunity to serve? We need you! Come out and help us get ready for camp! There are small tasks and large tasks for all ages. Donuts and lunch are provided. Please consider coming out and helping get your camp ready for summer! Join us as we celebrate New Birth! 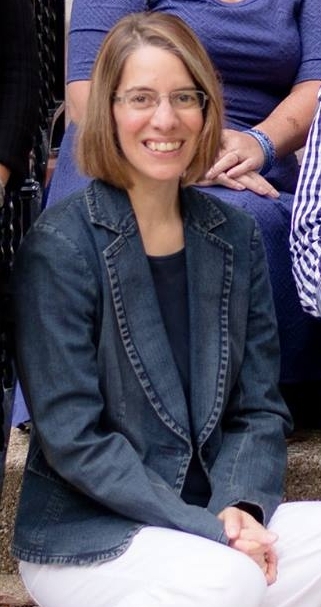 An evening of fellowship and worship, we will be hearing from Cheri Gamble from the Niles Pregnancy Care Center. Please bring an item you would normally bring to a baby shower as we shower blessings on the women at PCC. 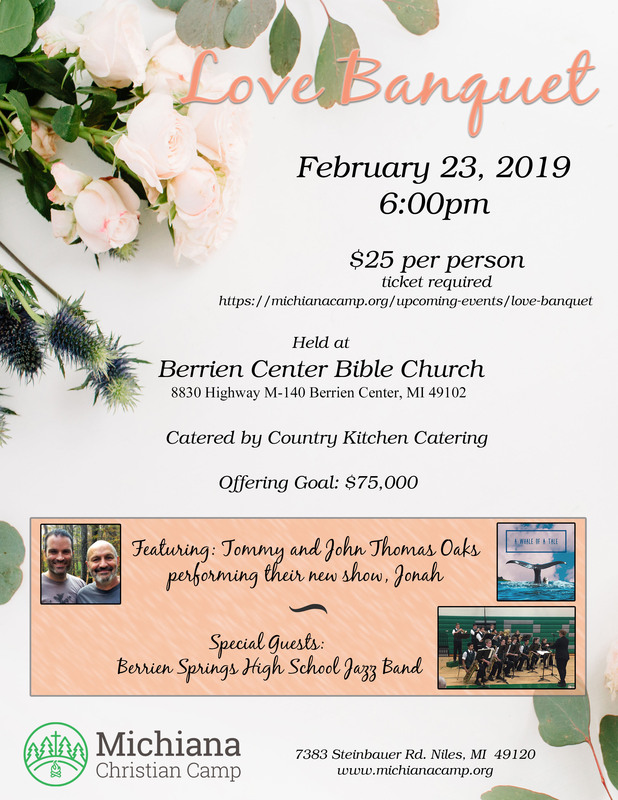 Our largest fundraising event of the year, the Love Banquet is an opportunity to come together and celebrate what God has done through Michiana Camp and look forward to what is to come. This event includes a catered meal, entertainment, and a camp update. It is held at the Berrien Center Bible Church in Berrien Center, MI just a few miles north of the camp on M140. Tickets are required.